Hombroich, an ex-NATO missile base near Cologne, Germany, has been turned into a public art and architecture park. And in the demilitarized zone between North and South Korea, a design-driven subdivision blossoms. The answer to post-military landscapes seems to be contemporary architecture. Andrew Yang reports. 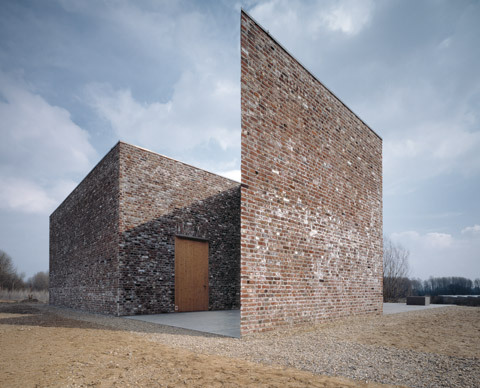 Erwin Heerich’s brick pavilions were some of the first buildings to be realized on Insel Hombroich. On October 7, the Center for Architecture unveils Field Experiments in art-architecture-landscape: Hombroich spaceplacelab, an exhibition that examines the conversion of a former NATO base on a patch of land known as Hombroich, near Cologne, Germany, into a utopia for art and architecture. Decommissioned in 1990, just after German reunification, the former missile base has been occupied since 1995 by the arts nonprofit the Insel Hombroich Foundation, started by art collector Karl-Heinrich MMller. With echoes of Marfa, Texassthe remote military-base-turned-art-preserve conceived in 1979 by Donald Juddd Insel Hombroich will see to the transformation of 650 acres of rolling green fields into a showcase of works by artists and architects, including lvaro Siza, Shigeru Ban, Frei Otto, and Tadao Ando. Named Insel,, or island, for its remote location, Insel Hombroich was purchased by MMller to house his vast private art collection. 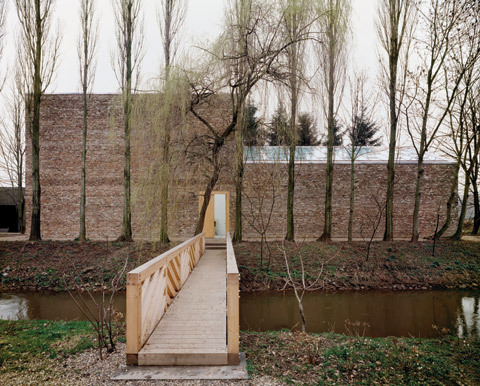 Shortly after, MMller enlisted sculptor Erwin Heerich to create a series of pavilions, housing galleries, residences, meeting spaces, and a cafeteria that have become the Museum Insel Hombroich. Furthermore, many of the site’s rocket silos and existing administrative buildings have been converted into artists’ studios and residences. By the time Raimund Abraham was asked to create the first architect-designed structure for the site in 1997, MMller became committed to the idea of developing a collection of art buildings created by an international coterie of talents. He asked Danish artist Per Kirkeby to design a bus stop, train station, and eight additional buildings and pavilions, which were completed in 2000. 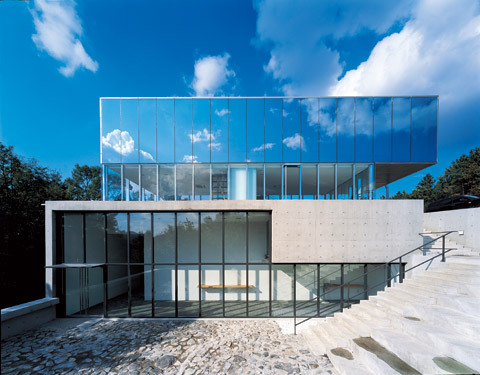 Tadao Ando’s Langen Foundation Building in Insel Hombroich was completed in 2004. Since then, Museum Insel Hombroich has invited 16 artists and architects to submit concepts for structures that would house art and engage the landscape. Each project was allotted 40 acresswith a central design requirement that they occupy only 10 percent of their plot. The remaining 90 percent is to be devoted to nature, such as woods, meadows, or landcaped areas. The museum soon realized that it needed a master plan to organize the new projects, which will be phased in over the next 30 years. That task fell to Barbara Hoidn and Wilfried Wang, from the Berlin-based firm Hoidn Wang Partners, who also curated the exhibition at the Center for Architecture. The prospect of redeveloping a former military site for artistic use has great practical as well as symbolic value. In much the same way that industrial spaces have become versatile venues for artists’ studios and art galleries, a decommissioned military base is ripe with opportunities for its sheer expanse, isolation, and open-endedness. The advantage of Hombroich is that it offers complete freedom,, said Hoidn. The artists were left to interpret the landscape as they pleased.. Moreover, the program’s emphasis on nature and creativity has resulted in designs that bring new life to grounds that were once devoted to weapons of destruction. A bridge extends from one of Heerich’s pavilions over the site’s natural pond. In 2000, Marianne Langen, another art collector, sought out MMller to house her and her husband’s collection on the Hombroich site. With his guidance, she hired Ando to design the Langen Foundation building, a concrete box within a glass box, floating on a shallow pool of water. The building, completed in 2004, adheres to the architectural vision set out for Hombroich. More new structures could evolve at Hombroich in this manner, as needed. Hombroich is one of the most ambitious examples of how art and architecture are being leveraged as tools for revitalization, as culture steadily replaces industry as a basis for the new economy. Nearby, in Duisberg, Emscher Park, a vibrant recreational attraction was forged from a dead industrial zone. The hope for Hombroich is that it also becomes an ideal environment for cultural production. An office and gallery pavilion sit on a former NATO site that is verdant, open, and sprawling. To provide a global context for Hombroich, the Center for Architecture will present two smaller exhibitionssone on Marfa, the home of the Chinati Foundation, and the other on an architecturally driven art settlement in Heyri, South Korea (both of which I helped to organize). Marfa, which opened in 1986, and Heyri, which started construction in 2000, could not be more different in scale and scope from Hombroich, yet they all share similarities such as optimism and faith in the power of art and architecture to transform the histories and fates of their sites. In Heyri, South Korea, the community house was designed by the town’s masterplanners, Jong Kyu Kim and Jun Sung Kim. Whereas the art completely transforms Marfa’s landscape and attempts to make the architecture secondary or virtually invisible on the site, the buildings in Heyri are dominant in the rolling hills of the Gyeonggi-do province in the demilitarized zone (DMZ) between North and South Korea. In the late-1990s, as the relationship between the two countries began to ease, and the DMZ became less of a contested site, the government sought approaches to develop this lush terrain, which is less than an hour by train from Seoul. A group of community-minded Koreans, led by the chairman of a large Korean art-publishing house, acquired the land from the government and conceived of a community where individuals could buy lots and build their own housessaccording to certain architectural guidelines. With 80 dramatic, assertive buildings already completed by firms including Minsuk Cho, Studio Himma, Yekong Architects, and SHoP, Heyri is already a showcase of progressive architecture, and a snapshot of what tabula rasa planning can produce in Asia. Glass, concrete, and steel are the favored palette among the residences, galleries, film studio, retail shops, and schools that now occupy the site. An additional 310 lots are slated for development. Hombroich, Marfa, and Heyri may be milessand worldssaway from the constrained geography of New York City. However, there is one local site that shares a similar, pending transformation: Governors Island. The 172-acre island, which has served as a military installation since 1776, was transferred in 2003 to the U.S. Department of the Interior and is now managed by the National Park Service. It is currently in a process of being planned for arts, tourism, entertainment, and other uses. The freedom seen at Insel Hombroich comes from not being afraid to experiment,, said Hoidn. What can New York learn from Hombroich? Give quality a chance,, advised Hoidn. And don’t compromise too early.. Andrew Yang is an associate editor at AN. The Hansook Cheong Memorial, a gallery devoted to a late novelist, was designed by Moongyu Choi of Ga.A Architects.